Moving has turned into one project… after another… after another– with seemingly no end in sight. My latest project is a dresser DIY. Not satisfied with anything I had seen on offer in the shops (and within a reasonable price range) I decided to find my ideal dresser design and paint it to my liking. I came across this beauty and honestly it must have been fate. It’s everything I wanted– it has feet (I don’t love dressers that sit on the floor), has a unique design (love the top drawers), and a good amount of storage. Also it’s in darn good condition to be about 40 years old! 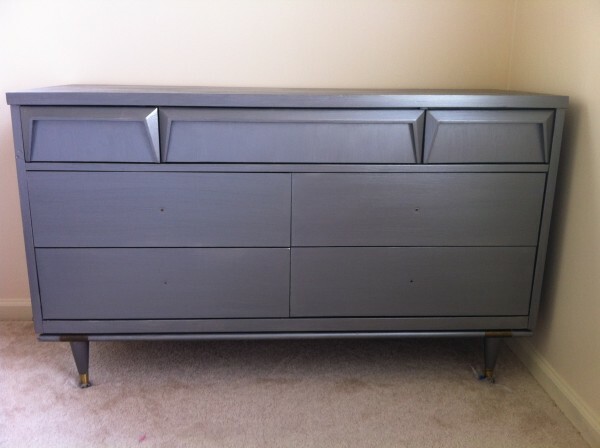 I’m painting the dresser a metallic gunmetal gray and am quite excited to see the results. I’d describe my decorating style as a mix between Hollywood Regency & Mid-Century Mod which make this dresser absolutely perfect once painted. The pièce de résistance?? It has a mirror too! Still can’t believe no one snatched this beauty up before I did! The top picture is of the dresser in the sanding stage. Forty years later this dresser had encountered a few marks and scrapes here and there, but nothing that a little sanding and paint won’t cover. 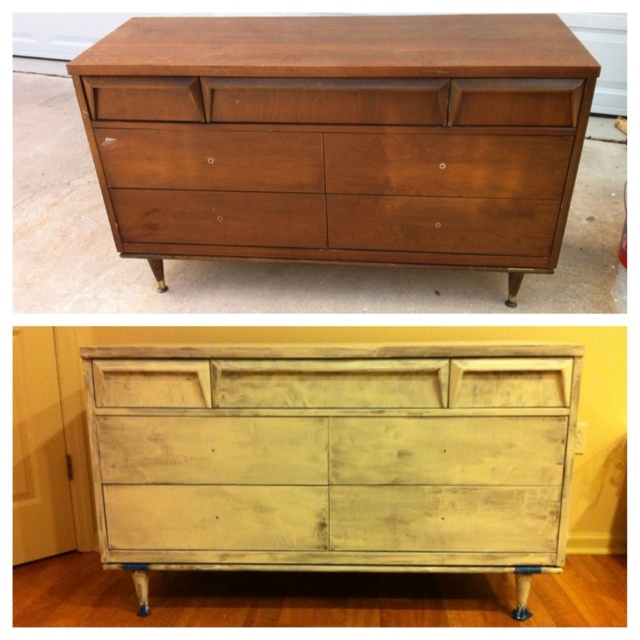 The bottom picture is the dresser in the paint process. I painted Kilz on first to try to eliminate any odors, etc and work as a base for the gunmetal paint. The finished product? Here she is! I left the original brass fittings intact and love the contrast between them and the gunmetal gray color. Now, I just need to select some hardware!